If you have not already fallen in love with Hushpuppy, aka Quvenzhane` Wallis, and Wink, aka Dwight Henry, you must see the award winning movie Beasts of the Southern Wild. The movie is directed and co-written by Behn Zeitlin, a 29 year old visionary. Behn created this masterpiece without any professional actors. It is a low budget film with a big message. 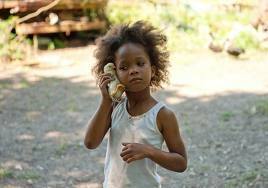 Hushpuppy reminds us that “we are a little piece of a big, big universe.” This movie will truly touch your heart. Click here to watch Oprah’s interview on Super Soul Sunday with Behn, Dwight and Quvenzhane. I cannot wait to see this film! I saw the interview too and was captivated by Hushpuppy, Wink and the director’s vision, humility, integrity and heart. Thank you for sharing this! Great movie! Bring your tissues! Ahhw, was hoping to find it close by, nearest I could find is Delray, I’m going!!!!! Thank’s for sharing!